Fill a bowl with fresh, tart blackberry fruit harvested from your own blackberry shrub. The fruit can be consumed fresh or added to your favorite pies. Blackberries are relatively hardy plants and can be grown in most backyards in USDA hardiness zones 7 through 9. The plants need occasional fertilization to ensure a large harvest and vigorous plant growth. 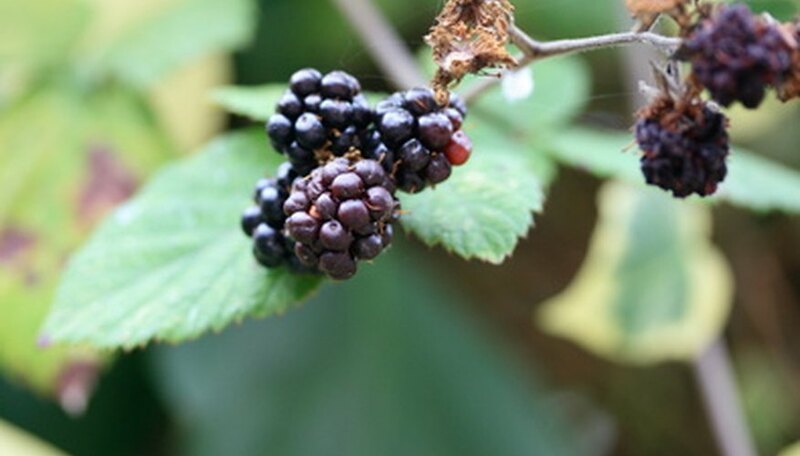 With the right care, you can enjoy your blackberry shrub's bounty for many years. Amend the soil before planting your blackberry bushes. Stir in 2 to 3 inches of compost into the top 6 inches of soil. This increases the dirt's fertility and concentration of organic matter, thereby helping the soil retain more moisture. Fertilize the blackberry bush once during the spring of its first year. This helps give the plant a boost as it enters the spring growing phase. Use a standard 10-10-10 (nitrogen-phosphorus-potassium) fertilizer. Sprinkle approximately 1/4 lb. of fertilizer around the blackberry bush in a circle with an 18-inch radius. Feed the blackberry bush twice a year starting in its second year of growth. Apply fertilizer just as you did the first time, once in the winter and once in the summer after you have harvested the blackberry fruit. "Bramble Production: The Management and Marketing of Raspberries and Blackberries"; Perry Crandall; 1995. "The Berry Grower's Companion"; Barbara Bowling; 2005.